The story continues as the business finds a new home and a blow of hate brings all together. "Teresa woke and could hear voices. For a moment she thought she should get up and go down stairs, but that thought passed as she tried to roll over in bed. She was going nowhere. Her mind walked through the past few hours and tried to wish what had happened away. But the pain in her face and the burning of her arm were real. She heard footsteps and was very pleased to see Molly. Molly had her arms wrapped around herself and looked so young." Teresa had found the right recipes. William was not surprised the cakes sold so fast, they almost sold themselves. He just had to get the store owner to taste them. One taste and they were hooked.Working side by side had been the right decision. Teresa hoped to repay the loan in just over a year. William was even right about the name “The Kitchen”. It was what everyone called it and it seemed to fit. 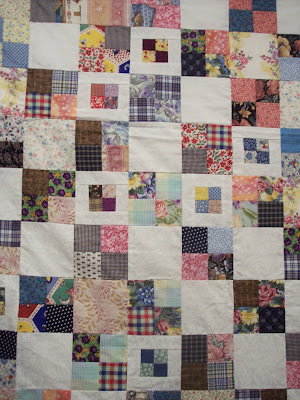 A First 4-Patch is the quilt awaiting you. Soft Color Cover - Color Quilts 5.5" X 8.5" Books average 30-45 pages, complete color quilt patterns/instructions for the quilt or quilts featured in the book. 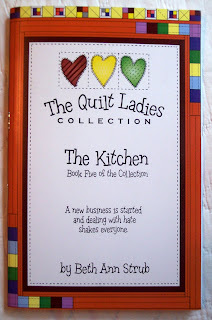 Story is Fiction but the quilts are very real.